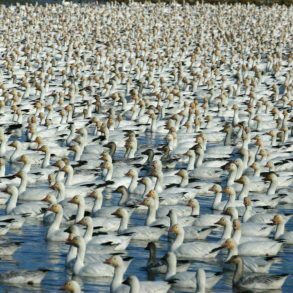 My condolences to orcas, Kermodes, and all other iconic B.C. 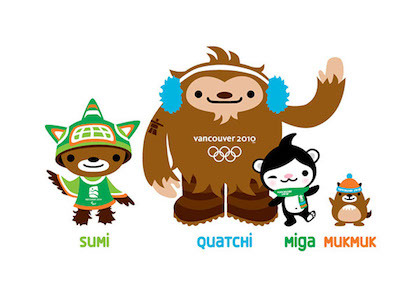 critters benched in the Vancouver 2010 Olympic and Paralympic Winter Games mascot competition. They were no match for the hockey-loving, tattooed sasquatch Quatchi, the enviro-sensitive animal spirit Sumi, and the snowboarding sea bear Miga, revealed to an appreciative crowd of schoolchildren in Surrey yesterday. The three mythical cartoon creatures, close cousins of Hello Kitty in appearance, are cute, colourful, and…they recycle. Though environmental responsibility may seem an unusual attribute in a mascot, promoters have been working hard to communicate the “green theme” of the 2010 Olympics. And as two-dimensional as Quatchi, Sumi, and Miga may be, their mandate is surprisingly complex. “[They] needed to represent the people, geography, and spirit of British Columbia and Canada, and they had to personify the values and essence of the 2010 Winter Games,” said John Furlong, CEO of the Vancouver Organizing Committee for the 2010 Olympic and Paralympic Games (VANOC), in his public statement. On the VANOC website, profiles of the mascots detail their connections to First Nations mythology, wilderness, wildlife, outdoor recreation, and the environment. Perhaps VANOC has loaded a little too much onto their small cartoony shoulders? At least one media critic has suggested that the mascots require too much explanation. And disappointed members of the public have remarked that the anime-inspired characters are better suited to Japan than Canada. But B.C. is a multifaceted place with complicated issues and a multi-ethnic population. With that in mind, perhaps Quatchi, Sumi, and Miga are the perfect choices.